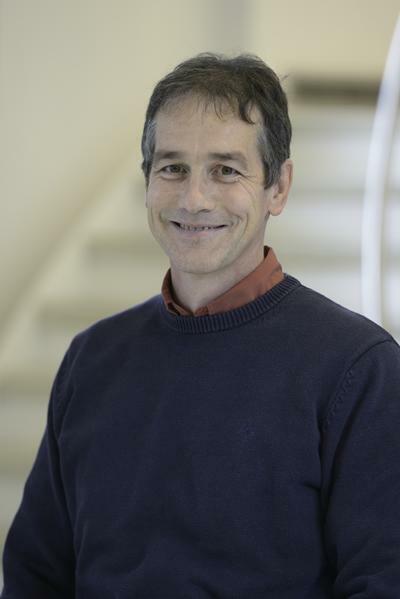 Guy Denuault is Associate Professor of Electrochemistry. His research focuses on electroanalytical chemistry with particular emphasis on the theory and application of microelectrodes, scanning electrochemical microscopy, nanostructured microelectrodes, and the modelling of electrochemical processes. He has been organising the Southampton Electrochemistry Summer School since 1998. Guy Denuault undertook his undergraduate training at the Reims Institute of Technology where he received his first degree and subsequently at Bordeaux University where he received his Master’s degree. He joined the Southampton Electrochemistry Group and carried out experimental and theoretical (analytical + modelling) investigations into the application of ultramicroelectrodes in mechanistic and kinetic studies of coupled chemical reactions. He received his Ph.D. in 1989 and moved to the University of Texas at Austin where in the group of Allen Bard he worked on the development of the scanning electrochemical microscope (SECM). He returned to Southampton and was awarded a 5-year EPSRC Advanced Research Fellowship. He was appointed Lecturer (1993) and Senior Lecturer (2000). He is the author / co-author of over 60 publications and 5 book chapters. He was the Secretary of the Electrochemistry Group of the Royal Society of Chemistry (1995 – 2000), visiting professor at the University of São Paolo (1998), University of Bordeaux (1999), National Polytechnic Institute of Grenoble (2006) and University of Oldenburg (2011-2012). In 2011 he became a Fellow of the Hanse-Wissenschaftskolleg Advanced Study Institute. His research on microelectrodes and scanning electrochemical microscopy has led him to deliver postgraduate courses overseas (Lausanne, Neuchatel, Bern, Geneva, Buenos Aires, São Paulo) and to present invited research seminars in the UK and abroad (Buenos Aires, Rio Cuarto, Rio De Janeiro, São Paulo, Campinas, San Carlos, Ribeirãon Preto, Venice, Bordeaux, Grenoble, Lausanne, Oldenburg). From his first year at Southampton he has been involved with the Southampton Electrochemistry Summer School, initially as a demonstrator and now as a lecturer and the main organiser. He has been teaching Physical Chemistry (in particular kinetics and electrochemistry) at undergraduate and postgraduate levels for over twenty years. He was Head of Teaching for Physical Chemistry (2002 – 2007) and School Examination Officer (2005 – 2010). Hamzah, H., Denuault, G., Bartlett, P. N., Pinczewska, A., & Kilburn, J. (2017). Electrografting of mono-n-boc-ethylenediamine from an acetonitrile/aqueous NaHCO3 mixture. Journal of Electrochemistry, 23(2), 130-140. Bragato, C., Daniele, S., Baldo, M. A., & Denuault, G. (2002). Oxygen as redox mediator in scanning electrochemical microscopy. Application to the study of localised acid attack of marble. Annali di Chimica, 92(3), 153-161. Nagy, G., & Denuault, G. (1997). Electron tunnelling at the Pt(100)vertical bar water interface. Journal of Electroanalytical Chemistry, 437(1-2), 37-44. Denuault, G. (1996). Microelectrodes. Chemistry and Industry, (18), 678-680. Yang, Y-F., & Denuault, G. (1996). Scanning electrochemical microscopy (SECM): Study of the adsorption and desorption of hydrogen on platinum electrodes in Na2SO4 solution (pH=7). Journal of Electroanalytical Chemistry, 418(1-2), 99-107. Frank, M. H. T., & Denuault, G. (1993). Scanning electrochemical microscopy: Probing the ingress and egress of protons from a polyaniline film. Journal of Electroanalytical Chemistry, 354(1-2), 331-339. Denuault, G., & Pletcher, D. (1991). Improvement to the equation for the steady-state limiting currents at a microelectrode - Ec' processes (1st and 2nd-order reactions). Journal of Electroanalytical Chemistry, 305(1), 131-134. Fleischmann, M., Pletcher, D., Denuault, G., Daschbach, J., & Pons, S. (1989). The behavior of microdisk and microring electrodes: Prediction of the chronoamperometric response of microdisks and of the steady state for CE and EC catalytic reactions by application of Neumann's integral theorem. Journal of Electroanalytical Chemistry, 263(2), 225-236. Denuault, G., Nagy, G., & Toth, K. (2012). Potentiometric probes. In A. J. Bard, & M. V. Mirkin (Eds. ), Scanning Electrochemical Microscopy, Second Edition (pp. 275-316). Oxford, GB: CRC Press. Denuault, G., Sosna, M., & Williams, K. (2006). Classical experiments. In C. Zoski (Ed. ), Handbook of Electrochemistry (pp. 431-469). London, GB: Elsevier. Denuault, G., Nagy, G., & Toth, K. (2001). Potentiometric probes. In A. J. Bard, & M. V. Mirkin (Eds. ), Scanning Electrochemical Microscopy (pp. 397-444). Chemical Rubber Company Press. Denuault, G., Andrews, L., Maguire, S., & Nugues, S. (1998). Scanning electrochemical microscopy (SECM): Application to the study of localised corrosion. In S. Campbell, & F. C. Walsh (Eds. ), Developments in Marine Corrosion London, GB: Royal Societry of Chemistry. Prien, R., Pascal, R., Mowlem, M., Denuault, G., & Sosna, M. (2005). Development and first results of a new fast response microelectrode DO-sensor. In Proceedings of Oceans - Europe 2005 (pp. 744-747). Institute of Electrical and Electronics Engineers. Prien, R. D., Pascal, R. W., Attard, G. S., Birkin, P. R., Denuault, G., Cook, D., & Offin, D. (2001). Development and first results of a new mesoporous microelectrode DO-sensor. In Oceans 2001. Vol. 3. MTS/IEEE Conference Proceedings: An Ocean Odyssey, Honolulu, HI, Nov 5-11, 2001 (pp. 1910-1914). Piscataway NJ, USA: IEEE. Bartlett, P. N., Denuault, G., & Gollas, A. (1999). A novel combination of an electrochemical quartz crystal microbalance and a scanning electrochemical microscope. In J. Leddy, P. Vanysek, & M. D. Porter (Eds. ), New Direction in Electroanalytical Chemistry II (pp. 109-115). Pennington, NJ: Electrochemical Society. Denuault, G., Frank, M. H. T., & Nugues, S. (1995). A description of the scanning electrochemical microscope (SECM) and of its applications. In Nanoscale Probes of the Solid/Liquid Interface. Nanoscale Probes of the Solid/Liquid InterfaceProceedings of the NATO Advanced Study Institute, Sophia Antipolis, France, July 10--20, 1993 (pp. 69-82). (NATO Science Series E; Vol. 288). London, GB: Springer. As convenor of the Southampton Electrochemistry Summer School I organise all aspects of the course.